Bridgeporth has expert processors with a combined experience of over 50 years who can help transform and enhance your non-seismic data, regardless of its source. Our particular strength is in the increasingly important fields of near real-time marine and airborne gravity and magnetics acquisition, where reliable and speedy processing is an absolute requirement. We use the global industry software leader in earth mapping and modelling to optimize our analysis and visualisation of gravity and magnetic data. That way we maximise the accuracy of your final interpretations and minimise the number of potential targets that require expensive exploration methods, such as seismic reflection or drilling. 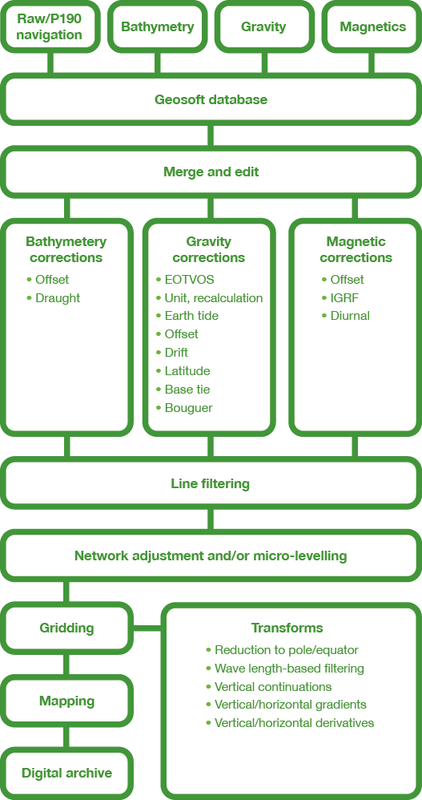 Processing, mapping, and 3D modelling of gravity and magnetics to support potential field exploration in deepwater, sub-salt, and sub-volcanic environments. Processing of LiDAR data for the analysis and monitoring of terrain and geological processes. Bridgeporth understands that sometimes you need your data to be processed in-house. We are happy to deploy our experienced processors globally to work remotely in your offices.